On Monday state lawmakers started a special session to work toward a budget agreement. Their decisions about investment in social safety-net services for the disabled and the Housing Trust Fund will affect community members across the state. Our “Policy Matters” blog series introduces you to people whose lives are directly impacted by state housing policies. Today we share the story of Ron, a single father who lives at YWCA Family Village at Issaquah. Ron’s community, along with many other safe, affordable homes, was built with help from the Housing Trust Fund. A few years ago, Issaquah resident and single father Ron Sordahl’s life turned upside down. The company he was working for went bankrupt, leaving Ron scrambling to find a new job in a tough market. Not only did Ron lose his job, but he also was in the middle of a divorce and a huge transition in his family. With no foreseeable income and a desire to remain living in Issaquah to continue parenting his 13-year-old son, Ron found his way to the affordable living community at the YWCA Family Village in Issaquah Highlands. Ron grew up in the area with his dad, who was the fire marshal for Bellevue and later, Redmond. After high school, Ron joined the Navy and enjoyed the experience of living for about 12 years in Japan and other smaller Asian countries. Ron speaks, read and writes Japanese. When Ron returned home to the States, he headed back to the community where he grew up. Ron’s been the student body president at Bellevue College, lectures director at the University of Washington, PTA president at his son’s school, and has held legislative and other government jobs. Adept at business including sales, imports and exports, and business education, Ron was able to easily land jobs that allowed him to live comfortably. Most people do not expect their lives will take a major tumble. Ron, like many, put aside money for emergencies and thought he was planning appropriately for his future. Sometimes, it only takes experiencing a crisis or two to have your whole savings and life plans wiped out. Ron’s life changed entirely a few years ago. Just recently, Ron was able to find employment with a major business in the area and is hopeful that he will continue to rebuild his life. Throughout the upheaval, the one thing that has stayed consistent is Ron’s relationship with his son, Tommy. Ron’s face lights up when he talks about Tommy’s accomplishments and engagement in his community. Tommy is now in seventh grade at Beaver Lake Middle school. He spends time between his mom’s and dad’s places and is quite well adjusted. He does very well in school overall and is in the Honor Society. He enjoys math and orchestra, is active in Boy Scouts, and is very involved in track and field. 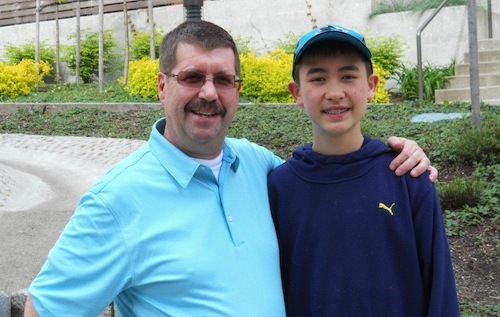 Tommy and his dad both volunteer in the community, church, and at Tommy’s school. We believe that Ron, Tommy and everyone in our state should have the opportunity to live in a safe, affordable home. Let’s make sure other community members who hit tough financial times have the same chance; advocate for investment in our communities through the Housing Trust Fund. Check out our Housing Trust Fund information page and infographic, and contact your legislators now.